history of objects: who created it, who has touched it, etc. The authors present two systems that incorporate some of these features: CoMotion, a collaborative environment for information analysis, and Reality Instant Messaging, an online system that augments online environments by linking them to real-time happenings. CoMotion allows users to share “frames”, which are completely interactive views on the data. Users can drag data in and out of a shared frame, share goals, questions, and interpretations of the data, in addition to automatically sharing the history of interaction with an object. In short, CoMotion incorporates all of the features of common ground except implicitly shared objects and the emotional reactions of the users. 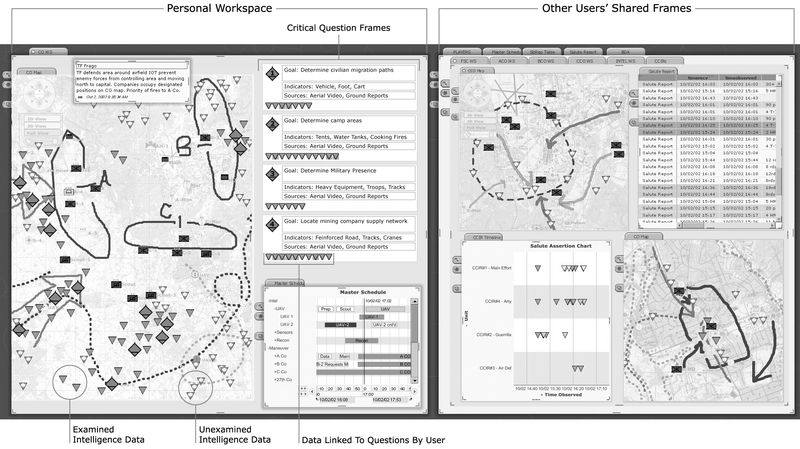 The Command Post of the Future is a case study in the use of CoMotion. The Command Post of the Future is a research project with the goal of providing collaborative visualization tools for disaster response and combat situations. The example shown below gives an idea of the power of the system. The left side of the visualization is the frame a commander is working on and sharing with his team. 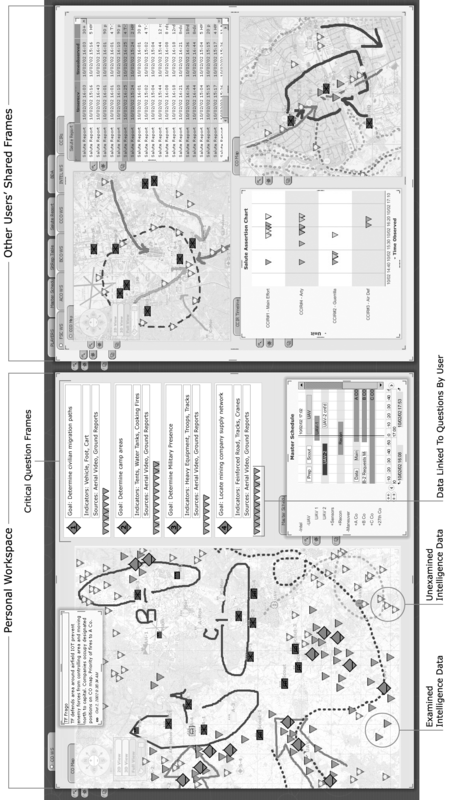 It contains a map annotated with objects: small triangles represent intelligence sightings, rectangles are units, diamonds indicate the commander’s interpretations of the intelligence sightings, and circles indicate tasks for the team to accomplish. Objects are additionally encoded to indicate whether or not they have been reviewed. The right side of the visualization shows the set of tabbed frames shared from other user’s workspaces. By looking through those, the commander can quickly see what each team member is doing or considering. Reality Instant Messaging, the other system that the authors present, provides implicitly shared objects and events, the history of objects, the level of attention on the objects, and well as the emotional reactions of the participants. Users can “buddy surf” to find users who are doing something of interest to them, such as watching a streaming sports program, and then subscribe to that Reality IM “channel” to interact with their buddies during the program. 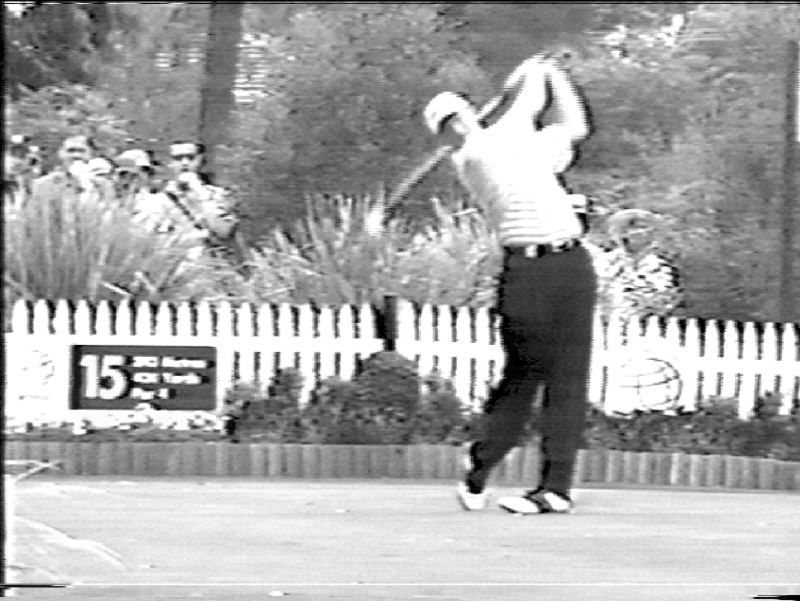 In the example shown here, the users are watching a golf program. The IM stream updates with play-by-play information, which the users may interact with by requesting more information about a player or participating in guessing games about the activity at hand. Users are free to participate as much or as little as they like. While the examples presented in this paper are compelling (CoMotion is incredibly cool and I want to play with it), I have reservations about a few points in the features of common ground. One is related to information overload; the other is related to social barriers. First, I am unconvinced that implicitly shared information is intrinsically important; if it were, it would be explicitly shared. If the song playing in the background of a user’s workspace is important to the collaboration, the user is likely to share it. Automating that kind of sharing (which is not actually implemented in the examples in this paper) requires a clear understanding of what implicit information is important, which is highly context dependent. In general, I feel that users accustomed to internet collaboration already explicitly share the relevant implicit information, removing the necessity to automatically share it in some way. The second reservation I have is sharing a user’s emotional/physical state. In many professional collaborative situations, particularly in disaster relief and intelligence, there significant social barriers preventing people from informing their colleagues that they are too exhausted/miserable to continue working. 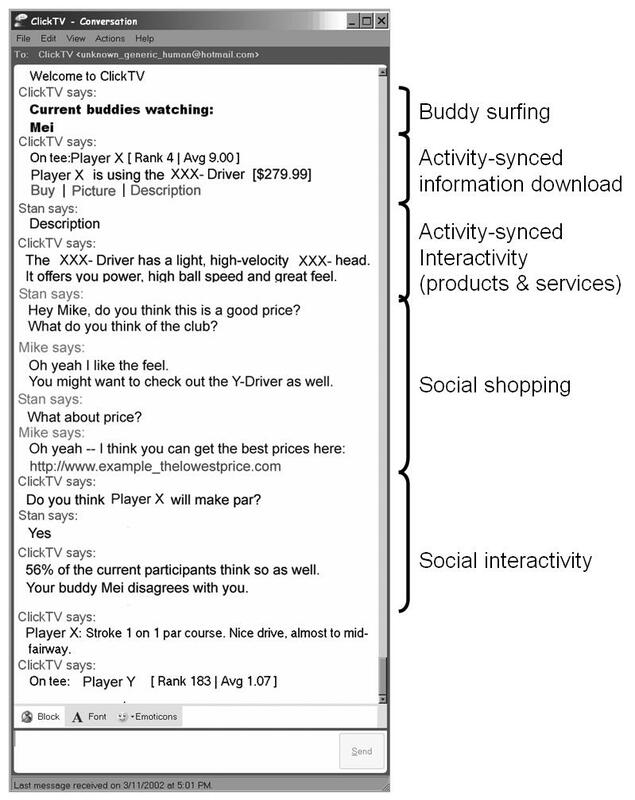 The authors suggest that incorporating audio and video into collaborative applications is sufficient for sharing such information, but while that provides a channel to allow other users to intuit a collaborators mental/physical state, it does not necessarily make the information explicit or encourage users to share it. What is your experience with online or remote collaboration? What aspects of common ground do you think are most important to the collaboration process? This entry was posted on February 24, 2012 by Rachel Shadoan in Uncategorized.